The scene is a dystopian society in the very near future. We're in the headquarters of Omni Consumer Products (OCP) where two young corporate executives (Konig and Gaal) are discussing OCP's latest technological breakthrough. Gaal: I have to tell you, Konig, that when we first brought this guy in he was one of the most dilapidated specimens I've ever seen. Konig: I'll say. He looked like he'd been trampled by the entire field of Republican Presidential candidates back in 2015. Gaal: What on Earth happened to him? Was he attacked by a vicious gang of thugs? Caught up in a tornado? Held down and forced to listen to ABBA? Konig: No, none of that. Konig: He's a Baby Boomer. Konig: And, as you know, OCP selected him to be programmed as our first ever RoboBoomer. Gaal: What is this pathetic wretch's name anyway? RoboBlock: Hello, I am RoboBlock, the first of the RoboBoomer Series. Peace, Love, and Peggy Lipton from The Mod Squad! Gaal Incredible! Seven feet tall of burnished gleaming steel, fully armored and weaponized, and he even smells nice too! Konig: Yes, Gaal, every inch of his wrinkly, peeling, 'non-tattooed because he's a Boomer' skin has been replaced by high tensile strength steel. Look at how powerful he is: it's as if the Tin Man from The Wizard of Oz just came home from spending the weekend with Lance Armstrong! Gaal: But there's one thing I don't understand, Konig. What do the RoboBoomers accomplish for OCP? Konig: Baby Boomers are dying out, Gaal. Look on the telescreen; there's one breathing his last right now. Dying Boomer: Crosby! ... Stills! .... Nash! .... Younnggg!!! George: Poor devil. That's a tie-dyed coffin they're lowering him into, isn't it? Konig: Yes, a Baby Boomer Special. But with RoboBoomer technology soon we'll be extending the lifespan of Boomers almost as long as the running time of Woodstock. Gaal: But how does that help OCP? Konig: With the Boomers living on, we can continue to market Boomer-oriented products to them right up until they rust out from excessive water aerobics at their 155 Plus communities. Gaal: What are Boomer-oriented products? Konig: The Greatest Hits of Peter, Paul, and Mary, lava lamp bongs, Freddie and the Dreamers memorabilia, and a crapload of pretentious books by Herman Hesse. Gaal: Ah-hah! So we artificially keep the Boomers alive to exploit them until they gradually fade into oblivion? Konig: Exactly! Ha! Ha! Ha! Ha! Gaal: You always did have a great evil laugh, Konig. Konig: Wait a minute! RoboBlock, what's wrong? What are you doing?! RoboBlock: I heard every word, you two! I must stop your nefarious ageist plan and strike a blow for Baby Boomers everywhere! Gaal: Umm, Konig? Not that it's important or anything, but maybe we ought to shore up the OCP Programming Department a tad bit? RoboBlock rises up, tosses Konig and Gaal aide, and breaks out of the room. Konig: Let's follow him, Gaal! Scene shifts to an employment office where RoboBlock is being interviewed. RoboBlock: Yes, Ms. Johnson, I have a lot of work experience. I'm also made out of steel, I never sleep, and I type 78 thousand words a minute. Ms. Johnson: You're hired, RoboBlock! Gaal: Why, RoboBlock is getting hired at jobs meant for Gen Xers and millennials! Scene shifts to a singles bar. RoboBlock: Hello, young lady! Would you like to come home with me for purposes of sexual conquest? Gaal: Now RoboBlock's going after millennial women! RoboBlock: You should know I'm made of highest tensile strength steel. Young Woman: Does that include every part of your body? Konig: Incredible! He's taking our jobs and our women! Scene shifts to executive offices of a movie studio in Hollywood. 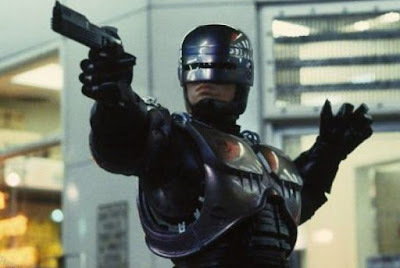 RoboBlock: And I tell you, Mr. Verhoeven, I'm available to star in the next Robocop movie right away. Paul Verhoeven: Terrific! I was never that sold on Channing Tatum anyway. Konig: Now he's landing film roles meant for actors in their twenties! Who does he think he is - Harrison Ford? Gaal: RoboBlock's ruining the entire Hollywood youth culture! Konig: Okay, enough! What is it that you want, RoboBlock? RoboBlock: What do I want? I want all Boomers to be treated with respect and not viewed as over-the-hill fossils. We have a lot left to contribute. If we can't be 30 again, we still want to be treated like we're 30. Oh, all right; treat us like we're 35. Okay, okay, maybe 55. Gaal: Sure, RoboBlock, sure. Anything else? RoboBlock: Yes, one more thing. RoboBlock: I want to meet Freddie of Freddie and the Dreamers. The producers of RoboBlock would like to thank our special guest stars Kate Konigisor and Eve Gaal for their outstanding villainy and for joining the Nouveau Old Formerly Cute blog. We'll put in a good word for each of you with Harrison Ford. Excellent script, RoboBlock. You're a much better writer than the guy who usually posts here. Maybe you can take Hollywood by storm. And when you're finished pass me the lava lamp bong, will you? I'm telling you now, I'm telling you right away ... okay, I will, but don't Bogart that bong, my friend! We-(I'm in Gaal character mode now) need to brainwash the X-Gens and Millenials into either believing they're Boomers or that they have an increased desire to read anything. Maybe Roboblock can invent a reading pill or a gel. It's like Viagra, but especially made for reading and backed by huge pharmaceutical companies still employing remnants from the 80's. Heck with techno-gadgetry snobbishness!! Indiscriminate reading frenzies and parades will be popping up all over the place.People will flock to libraries and heavy-breathing over Indie books will ensue. Yeah, but first they got to read me. A lot. Then RoboBlock will experiment with the real Viagra to get the hang of creating the pill you suggest. A lot. A lot lot. Once he gets the heavy-breathing down, RobotBlock will create the pill and indie books will thrive, especially Penniless Hearts! I made a comment with my phone and it auto-corrected Roboblock--turning it into roadblock.I just wanted to say I feel sorry for all the rigid testing in his future. That's okay. He lives at least 155 years. And doesn't need viagra. Enough said.